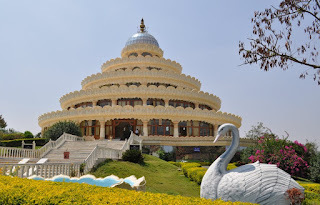 Last week I decided to stay at an ashram. I wasn't planning to do it, I didn't feel like I was searching for anything or really wanted to go to an ashram - I didn't really need that "Eat, Pray, Love" experience. But Michael and another person I know had gone for the three day introductory course and said it was "life changing," and "one of the best things to do in India." The Art of Living is an international NGO, just outside of Bangalore. Sri Sri Ravi Shankar is the ashram Guru and he happened to be at the ashram while I was there which was a bonus. Everyone simply calls him Guruji, meaning "one who has great knowledge or wisdom." My course started Friday morning so I had to be there Thursday night. Michael had warned me that the food and rooms were very basic. Our driver was in the hospital and the temporary driver assured me he knew where the ashram was. I left home at 6:45pm expecting a 1 1/2 hr drive and wasn't too worried when he stopped to ask directions after one hour. He did a u-turn and said he had missed the turn off - no problem. But after awhile he did another u-turn and then another u-turn at the same place as the first time. Of course it was dark and the road was busy, and there we were going around in circles. I told him to pull over - I phoned Michael to get directions and the driver phoned my regular driver who was in the hospital. After a few phone calls and a short lecture "don't tell me you know where it is when you don't..." we got on our way and finally found the right exit. Between phone calls to Michael and the driver in hospital we arrived at 9:30pm. The place was packed with people checking in. It turned out there was a teachers refresher course going on that weekend too - there were hundreds of them. I got to go to the foreigner check in (no line up), I also got to pay the foreigner price of $200US for the 3 days (not bad) but nationals probably paid a fraction of that. Got checked in at 10:00pm and then onto a shuttle bus to the accommodation. I was the only one who got off at the "Nandhi" building and went to look for #14. The lower ones were all in the 100's, so I went upstairs but they were the 200's. Finally saw a girl and asked her and she said "Nandhi building - you have premium accommodation" and she pointed across the street. So off I went to a tall round building, up the spiral staircase lugging my luggage and sweating all the way to the top floor to #14. There I found three guys standing with towels and sheets, which I thought was weird - I just assumed the building would be all female. They informed me that they were there to make up my bed but there was someone inside who had locked the door and they couldn't wake her up (it's a triple room). So I knock, they knock, we call out...and every other door on the floor opened and people came to see what the commotion was. But we couldn't wake this person up. Finally I suggested they phone reception and get me another room, which they did. Down we all went - it's now 10:30pm - and we walked to the furthest building where once again the door was locked and we knocked, but luckily the woman inside woke up and opened the door - I'm sure she was not impressed, but then again - neither was I. The room was very basic with two single beds, bedside tables, a small bathroom, an outdoor sink and a fan that was whirling as loud and as fast as helicopter blades. Quick introductions and then into bed. I couldn't help but wonder about that "premium room." Even though it was a triple - was it better? My class didn't start til 9:30am Friday morning so I set my alarm for 8:00am and slept restlessly. At six one of the lights went on - my roommate was up. I closed my eyes and turned over. Then I heard her doing breathing exercises, similar to what I do in yoga. Then it went quiet but the light was still on. I roled over and opened one eye - she was sitting cross-legged on her bed facing me, eyes closed, with both arms straight up in the air - welcome to the Art of Living! Are you sure that this Sri Sri Ravi Shankar is not another fake Sawmi? Sorry if I am being biased. I have nothing against him but lots of these Indian Swamijis are exposed with the corruptions at a later stage. Good point as there are many fakes. Having been there for 3 days I am definitely no expert on Sri Sri. Just telling my experience. One must be very careful with these type of things especially those who are "lost" and "seeking" - those most vulnerable to be taken for a ride. As I mention in my next post I did not get that feeling, but 3 days is not enought to judge.